The new £7 million sports facility at Cheriton Road, Folkestone, opened its doors on Friday 15 March 2013, providing a centre of excellence for hockey, cricket, netball and running. Three Hills Sports Park will also provide facilities for a range of other indoor and outdoor sports. 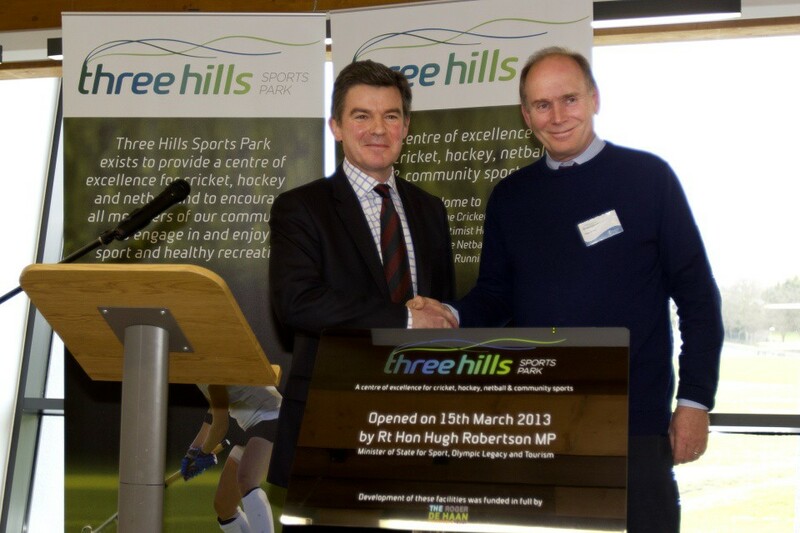 The centre was opened officially by Rt Hon Hugh Robertson MP, Minister for Sport, Olympic Legacy and Tourism. It is the realisation of an ambition by Folkestone Optimist Hockey Club and Folkestone Cricket Club to create facilities that will help develop their sports and sustain them in the future. Cricket and hockey have been played on the site (previously known as Cheriton Road Sports Ground) since the 1920s. However by 2008 the clubs had concluded that the existing shared clubhouse, cricket and hockey pitches needed considerable maintenance, and that the future of both clubs was at risk. As they began to seek funding for renewal of the facilities, representatives of both clubs met Roger De Haan, who was impressed by the approach of the project team and encouraged them to develop more ambitious plans. Netball was introduced as a third core sport and, once plans were finalised, The Roger De Haan Charitable Trust offered a substantial grant to cover all of the development and construction costs (amounting to over £6.8million). Shepway District Council agreed to support the venture by providing a 125 year lease on a peppercorn rental.